SHUNGITE— MEDIUM. Approximately 1 1/4"-1 1/5", by 1 1/5-2 1/4" Shungite formally known as Carbon Black) is an amorphous variety of graphite of intense black color. Its a natural composite with a homogenous distribution of crystalline silicate particles in a carbon matrix. Fullerenes (a unique class of carbon-based molecules whose discovery led to the awarding of a Nobel Prize in 1996) have been discovered in this mineral. On the Mohs scale of harness, SHUNGITE rates as fairly soft, falling between 3.5 and 4, it should be handles with care (Quartz family is 7.5 hardness). SHUNGITE is found in very ancient layers of Earth's crust that were formed approximately 2 billion years ago when there was virtually no life forms on the Earth. It has been theorized that marine sediments enriched by the organic remains of primitive microscopic organisms that lived in the shallow bays of ancient seas served as the basic material for the formation of shungite. Alternatively it has also been suggested that it may possibly be volcanic or meteroric (Phaeton) in origin. Whichever of these proposals hold truth, it cannot be disputed that SHUNGITE with its unique healing propoerties and abundance of remarkable characteristics is a mineral like nothing else on earth. SUNGITE has diverse properties: It grounds, heals, clears, imporves, protects ,neutralizes, and regenerates energies. As it is a grounding stone that holds ancient wisdom, SUNGITE benefits the bearer when work or carried. When places in the wearers socks it can dissapate fatigue. Whne placed under a pillow it helps to guard against nightmares. SUNGITE neutralizers of negative energies, clearing energy fields of disharmonyious vibrations. It can assist in raising ones deeper consciousness and allows a portion of that higher vibrational energy to be consciously directed by the will. In addition, it has also been said to possess the uniwue property of shielding the body against harmful electromagnetic radiation. 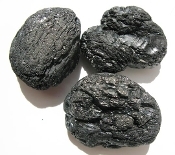 SHUNGITE strengthens psychic awareness, and may be of assistance in channeling energies towards increasing ones fortunes. Clearing methods include weekly smudging and running under cold water every 3-4 days. Because of its black color, SHUNGITE is associated with the Root Chakra and Earth Star.